New York City may have more women-owned businesses than any other city in America (yay), but it’s still far from an equal playing field in many industries (boo). Which is why it’s especially inspiring to see female chefs, restaurateurs and entire teams killing it in the city’s hyper-competitive food scene. And while you should absolutely visit these spots to support the sisterhood, you should also go just because you’ll get a really, really great meal. Here, 15 female-fronted restaurants we love. Three queens run the show at this downtown bistro: chef Clare de Boer, chef Jess Shadbolt and general manager Annie Shi. King presents the type of gorgeously plated, flawlessly prepared food you’d expect at a chic European café, with a daily-evolving dinner and lunch menu inspired by southern France and Italy. Deceptively simple yet hugely flavorful dishes can include tagliarini twirled with slow-cooked tomato sauce, wild halibut with grilled asparagus, lentils and anchovy and the recently Insta-popular pink chicory salad. Helmed by wine director and owner Samantha Safer and chef Claire Welle, this Clinton Hill neighborhood bistro fills up nightly with familiar neighborhood faces eager to munch on beef fat-fried chickpeas (before they sell out) and gulp down a unique glass of natural wine, per Safer’s expert suggestion. Specials are abundant and the menu shifts with availability and seasonality, but dorade served with crispy skin in a lobster-based sauce, as well as the end-of-the-night cheese plate, shouldn’t be missed. Owned by Harlem native Yvette Leeper-Bueno, this Harlem restaurant is not only run by a team of women—Executive chef Mimi Weissenborn, bar director Ashley Lugo Brown and consulting wine director Chelsea Carrier—it’s also dedicated to boosting other female entrepreneurs, by spotlighting small-batch distillers and wine producers. A Northern European-inspired menu includes several dishes that pair well with wine (really, though, what doesn’t? ), including whole burrata salad, spicy veal meatballs and rosemary-laced pappardelle in lamb ragu. 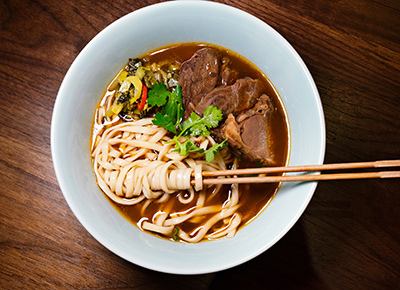 Chef Esther Choi started slinging Korean-inspired ramen in Chelsea Market in spring 2015, and barstools were quickly filled with diners hungry for gravy-soaked disco fries and gochujang-pork broth. Last year, Choi expanded with Mokbar BK, a larger outpost where she offers upscale renditions of the Korean comfort food she grew up with in New Jersey, including a jip-bap (“home meal”) set menu, a range of homemade mandu (dumplings) and a “saucy” (as opposed to “brothy”) bulgogi ramen. A park bench at the corner of Manhattan’s Hudson and Jane streets marks the starting spot of chef Megan Johnson and partner Jen LaPorta’s relationship, and although their restaurant is in Fort Greene, their relationship is cemented in its name. The all-day eatery kicks off mornings with breakfast sandwiches and vanilla-custard French toast sticks, followed by hefty melts and salads for lunch and comfort food staples like bacon-wrapped cheese curds and a grass-fed burger for dinner. Beloved for its tiny size, massive flavors and East Village mainstay status, Gabrielle Hamilton’s Prune deserves every accolade it gets (and there are many). Reserving one of the few tables is notoriously difficult but worth waiting for in order to stick a fork in Hamilton’s deep-fried sweetbreads, delicate homemade pastas and changing roster of entrées, like a recent short rib braised in pho broth or whole grilled branzino doused in infused fennel oil. Bar snacks should also not be ignored, like the camera-ready Turkish disco pistachios, lit aflame at the table. Chef Amanda Cohen’s legendary restaurant might be the most fun you can possibly have with edible plants. Two tasting menus, The Vegetable Patch ($58) and The Vegetable Garden ($84), offer optional wine pairings and present a spread of uniquely prepared greens, like a salad composed of foraged produce, broccoli prepared in the style of hot dogs, kale matzo-ball soup and some seriously creative desserts (like whatever this wizardry is). Founded by the “Queen of Soul Food” herself, Sylvia Woods, in 1962, this restaurant has become a Harlem staple and a destination for visitors from all over the world. Still run by Woods’s family (her niece runs her own soul food spot, Melba’s, also in Harlem), Sylvia’s doles out hearty breakfast platters until afternoon, Southern-style fried chicken and seafood, as well as sides worthy of making a meal out of: buttered corn, okra gumbo, baked mac and cheese and many, many more. Originally from Thailand, chef Suchanan Aksornnan (aka Chef Bao Bao) studied French culinary technique, and she effortlessly fuses the two cuisines into upscale yet approachable pan-Asian fare at her Greenpoint restaurant. Dim sum, bao and hot pots are all on the menu, but noodle dishes, like seared duck-breast ramen in black truffle consomme and rib-eye pho in bone marrow broth best show off Chef Bao Bao’s technique and creativity. Downtown restaurateurs Rita Sodi and Jody Williams (of I Sodi and Buvette, respectively) partnered up for this charming hub for pasta and veggies, born out of the chefs’ shared love for Italian food. The cacio e pepe is known to be life-changing, as are the various elegantly prepared seasonal vegetables, like grilled raddicchio with goat cheese, currants and pine nuts. New York’s first and only Druze restaurant is run and owned by Gazala Halabi, an immigrant from Israel and one of very few Druze people to ever to permanently leave the Middle East. Familiar Middle Eastern and Mediterranean fare, like stuffed grape leaves, crisp falafel, tangy labne, bourekas the size of your face and super-thin pita are all made by Halabi herself. Owner Maiko Kyogoku works with chef Emily Yuen to create an elegant, refined Japanese menu in the heart of lower Manhattan. And while shareable dishes like uni-topped crispy rice and tempura udon shouldn’t be missed at dinner, the brunch is seriously unique: Think Wagyu steak and eggs, eggplant shakshuka with miso tofu labne and Japanese-style pancakes with black sugar syrup.